Melissa Regan Agency, with Mark Shaw photographic archive, present the first of a series of photographic expositions of Mark Shaw’s epic work. 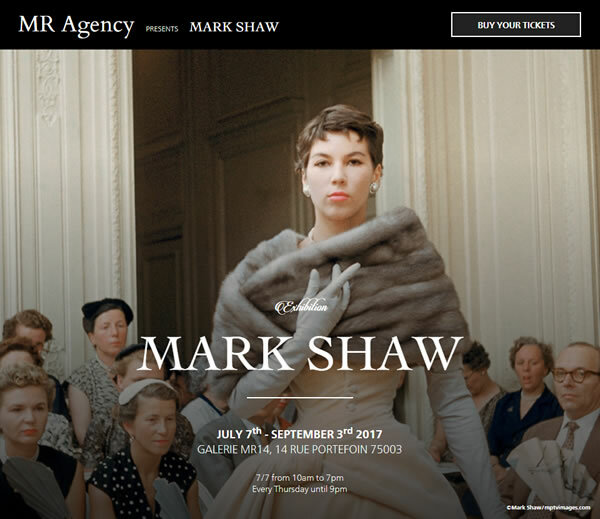 Opening during Paris Haute Couture and the year of Dior’s 70th anniversary, the exposition Mark Shaw « Paris Haute Couture » takes place from July the 7th to September the 3rd at Galerie MR14 in 14 rue Portefoin, 75003. The unprecedented exposition brings together the photographic work of Mark Shaw during the 50’s Haute Couture for fashion houses such as Balmain, Dior and Balenciaga.